Jason Geane at the Tequila Mockingbird. That’s how Jason Geane, 42, describes himself, and rightfully so, as he recites the names of various brands and types of tequila as if he were quoting ingredients from a recipe. A certificate from the Tequila Regulatory Council (Consejo Regulatario del Tequila) in Mexico, recognizing Tequila Mockingbird’s expertise with the liquor, hangs in a corner of the bar at the 6 Forest St. restaurant, where Geane has been the bartender for 15 years. Q: How did your interest in tequila come about? A: My love of tequila started over 20 years ago. I left corporate America and decided I was done with sales. I didn’t feel like it was my thing. When I got into the restaurant business, I started out at Ocean Drive in South Norwalk, a restaurant which is now closed. They had this big tequila collection and I started trying some of them and it kind of hit a nerve, something in me — it was just good tequila. The tequila I had had prior to that was what everyone had. At Mockingbird we don’t have any “mixtos” (meaning less than 100 percent agave) — even our cheap tequila is 100 percent agave. One of the brands that really stuck out was Chinaco. I started drinking that and Herradura, and those styles really hit something with me. This is what tequila really is, and it just grew from there, and I took it to myself to learn more about the spirit. I was around 25 at that time. Q: How did the trip to Tequila, Mexico in 2012 come about? A: Diageo, the company that owns Don Julio, had this educational trip for their workers, and we were told that there was space for us to come. We had helped build the brand here through work that we put in with Diageo. They said that if we paid for the flight ticket down to Mexico, they would take care of the rest. I was about five to six years in at Mockingbird when that happened. I’ve been back to Mexico since, but that was my first trip and it was life-changing. It was very significant. There I was, a kid who thought he knew everything about tequila, and I did know a lot, which helped, but the uptake when I got there was very quick. Q: What did you get out of the trip? A: The taste, the experience and the people who make the spirit — seeing that for the first time was a game-changer. It rounded out my knowledge base and made me the expert that I thought I was. There are not many “gringos” who know as much about tequila like I do. It was a four-day trip. Learning about the lowlands and highlands and seeing the differences from the changes in altitude made us learn about how the agave grew. I talked to Enrique de Colsa, the master distiller for Don Julio tequila, about what makes the highlands tequila so much different from that of the lowlands. Q: What stuck with you from the trip? A: Valuable knowledge you only get from going down there. Seeing the roasted agaves and tasting that firsthand before fermentation. All those smells, touch and taste points were a game-changer and definitely life-changing. One of the cooler things in the fields is the role of the “jimador,” a very special position in the tequila business. They use a “coa de jima” (a tool resembling a hoe) or machete to trim the plants and they’re doing that and communicating with the master distiller and another team brings the plants to the point of processing. The business is passed on through generations, and the tequila business is changing, unfortunately, and it’s going to jeopardize them first. Q: How do you see the tequila business now? A: It takes eight to 10 years for the agave to mature properly, and that puts a strain on growth when demand is high. A lot of the conglomerate deals that are happening are very bad for the business. The Bacardi deal — (Bacardi Limited bought Patron Spirits International in late January) — is terrible for the business. Bacardi already owned 30 percent, so now they have a majority. It puts a significant strain on the growth table of the agave and also brings to call one of my least-favorite methods to produce tequila. That’s where all alcohol is going and it’s marketing. It’s the message that makes you gravitate toward it. The customer doesn’t care about what happens in the background, the things that I care about. Jobs are being lost, families are being put out of business or other things in the business that make tequila what it used to be, they’re disappearing. I’ve seen this from the beginning since I started drinking tequila. The demand level for tequila is so high right now that it’s forcing people to cut corners and make a lesser product, in my opinion. Q: How is it working at Tequila Mockingbird? A: This place has been a blessing; I’ve grown up here. All the people who come here consistently and support this business, and obviously me, have been great and it’s a unique situation. In many other bars you don’t have that, a staunch amount of regulars. We are a come-as-you-are, no-judgment kind of place. We’re one of those places where you can come by yourself and engage in conversation on just about anything with anybody. Q: What is your favorite tequila? How do you get customers to learn about it? A: Most people don’t know much about tequila. 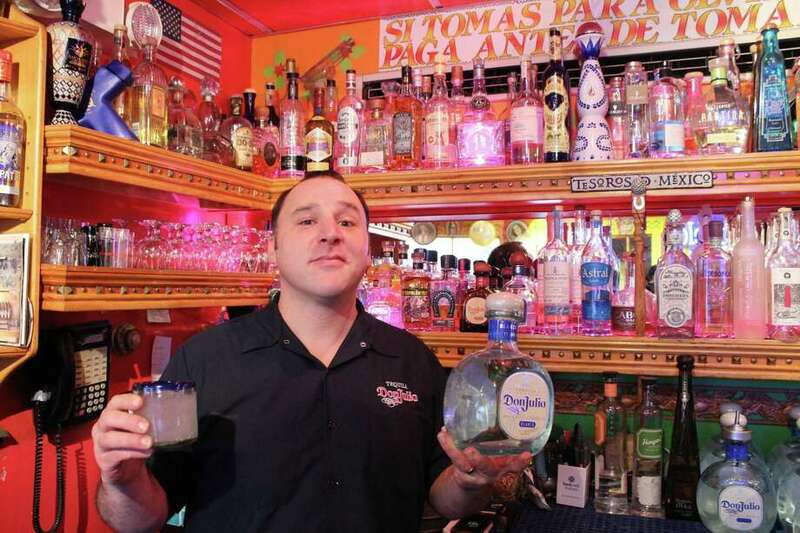 They’ll walk in and ask for a “nice tequila” and I’ll always ask questions because I want to line the customer up with something familiar to their palate, something they had had before, and move them forward into finding the tequila that’s right for them. Once you start drinking tequila, you’ll find the ones you really like. It’s all about getting that first one. My favorite brands in general are the Siembra Azul and Siembra Valles. They’re unique because they distill Siembra Azul in the highlands, but partnered with another family in the lowlands to produce the other one, Siembra Valles. Don Julio in general is one of my favorites. Their portfolio is fantastic, they still have a heavy tradition and quality level compared to other macro-level tequilas that you see. On a micro level, Fortaleza is probably next in line. And of course, I love my Chinaco.